Check the link below for a Really Blunt Review of THE PROVING chapter 1! This is really good stuff. I naturally love the positive comments, but I also really appreciate the constructive criticism about structuring action scenes and general writing craft. This entry was posted in Uncategorized on December 14, 2015 by thetomewriter. I did not appreciate the truth of that quote when I began writing THE PROVING six years ago. But back then, the novel was called EMERGENCE, was 140k words, had completely different characters and settings, and broke all of the rules of plot management. That was me ‘going out my front door’, and I am stunned when I recognize to where I have since been swept off. I cringe now when I look back at that ponderous first draft that I was just positive would be loved by agents and editors alike. I remember thinking that surely I had a chance to be published within a year or so… maybe 18 months at the outside. Not so much. But as in Frodo’s case, the journey – while painful and long – had tremendous value. Now it’s October of 2015 and I am well into the sequel to THE PROVING, titled The COUNCIL OF LORDS. But I don’t have to repeat the mistakes of 2009. I can spot passive text, word repetition, and poor dialogue structure from across the room. The Author Salon “Six Act, Two Goal” construct guides my plot. Multiple levels of conflict are weaved through the text, and close points-of-view are frequently employed. While I know there will be many, many re-writes to book 2 before it is finished sometime in 2016, I am willing to bet that it will be a far superior product in much less time. But that does not reduce the impact of Bilbo’s quote. Having finished chapter 1 of tCoL, I am again stepping out my front door. While I have plotted and planned to the hilt, I have no intention of keeping my feet. The story and its characters will inevitably sweep me away and take me places I never envisioned, and that is all at once terrifying and wonderful. In the meantime, THE PROVING is being read by my dream agent, and sometime soon I will know if a very exciting new chapter of my writing career is about to begin… or not. And I continue to query other agents, at least a handful a week, using the strong new query letter the fantastic Carey Corp helped me craft. Working while waiting, waiting while working, this is the process. Many authors in social media use pregnancy as an analog of writing. Having watched my GeniusWife give birth to five beautiful babies, I must say that I completely disagree. With pregnancy, from the very beginning you have a pretty good idea when the process will end. With writing, you can get to the end of the third trimester and… surprise! Six more trimesters to go! So I wait and work, collecting rejection emails, coveting feedback when I can get it, and dreaming of that day when an agent says “YES”. This entry was posted in Uncategorized on October 25, 2015 by thetomewriter. In the last post I mentioned the new and improved first chapter of THE PROVING… but failed to share! So the new creation is posted below. There are two significant changes surrounded by dozens of small edits. Most notably, Kir’Ana is no longer trying to re-create a past event when she passes through the door at the Steward’s Gate. Instead, she discovers her talent for passing through solid objects right there on the spot. The other major change begins with a brand new set of opening sentences designed to draw the reader further into Kir’Ana’s perspective. I am always open to sharing the entire book with anyone out there who wants to be an early reader. The only requirement is feedback; any and all is welcome, and the more critical the better! Kir’Ana awoke with a start, wind whipping through her hair and garments as she plummeted through darkness. Below, and getting closer by the second, loomed the castle’s moonlit courtyard. Instinctively, she threw her hands before her face as if to somehow block the approach of death. As Kir’Ana closed her eyes for what she knew would be the last time, the castle’s courtyard still sped closer in her mind’s eye. She realized that it was not what she expected. Shouldn’t she instead be seeing her life – all sixteen Summers of it – flash before her eyes while she faced such a brutal end? She cried out as her hands, head, and knees smacked the unforgiving pavement. She rolled onto her back as a wave of dizziness struck. Clutching her forehead and panting as pain shot through her body, she sat up, opened her eyes, and fought to orient herself. The dizziness faded and her mind snapped into order. Patting her face and torso rapidly, she took stock of the obvious truth. She was alive, and this was no dream. She looked up at the castle walls looming high above her, having no idea what she expected to see. There had not been a way in or out of the building above the east-facing courtyard for nearly forty years. It suddenly occurred to her that she may have been attacked. An assassin! I was pushed, or thrown, from the heights of the castle’s roof. After being drugged maybe? A chilling realization hit her. Assassins could still be in the castle! With one loud shout she could bring scores of the Royal Guard running from their posts, and within moments any invaders could be located and seized. But calling the guards would mean calling attention to herself, the girl who had just survived a hundred foot fall with only superficial wounds. I didn’t die. It’s another symptom, which means I am completely hopeless. And I definitely can’t call for help and risk revealing the truth. She stumbled to her bare feet, remembering Sir Jason’s strong voice repeating his favorite phrase. Stay in rhythm… Stay in rhythm. The knight had drilled Kir’Ana since she was a child to focus on the immediate, rejecting distractions of any kind. Keep your mind and body immersed in the rhythm of the moment, he would say, whether during combat or the delivery of a speech. Stay in rhythm. Stay in rhythm. Sir Jason’s words again rose to the surface of her mind. One thing at a time. Live in the moment. Nearing the corner, she tied the long white sleeve around her brow like a sweatband, wincing at the pain of her raw forehead. Kir’Ana peered around the castle’s northeast corner, crouching low. She watched and listened for a full minute before deciding it was safe and creeping over to the Steward’s Foyer awning. “Nightwings!” she cursed under her breath. The massive foyer doors were closed. A group of three guards stepped into view from across the Steward’s courtyard, talking quietly. Kir’Ana dove behind a stack of barrels just a few feet from the Foyer and held her breath. Her heart pounded and her wounds throbbed painfully along with it. Panic rose within her throat. The troop walked to within feet of her hiding place, then continued their march into the courtyard. Kir’Ana exhaled, then crept over to the ten-foot high wooden doors barring passage into the Steward’s Foyer and the kitchens beyond. Maybe it’s not latched? But she knew the chances were slim. She placed both hands on the cold wood and pushed. The great doors didn’t budge. She pushed with even more intensity, putting all of her weight against the locked portal. I must get inside! Her vision blurred with exertion and pain, forcing her to stop. This is foolishness. I’ll have to find another way. With a deep breath, she rested her aching head on the cool wooden door and closed her eyes. And landed with a thud on the stone floor inside the Steward’s Foyer. She stifled a scream as she lay there on the other side of the still-sealed door. Her feet were not completely through. Her legs simply ended at the surface of the door’s planks as if sliced off. Her feet were still on the other side of the solid wood, the night breeze chilling her toes. With a whimper-like yelp she yanked both knees towards her chin and rolled to a crouch. Her feet and legs looked fine, as if nothing had happened. Trembling, she stared at the door as if somehow it were to blame. A tentative touch to the darkened door revealed that it was, in fact, solid. But she had just passed through it as if it were no more substantial than smoke. Long minutes passed before Kir’Ana regained her composure. She slowly stood, pulled her eyes away from the door and focused on getting back to her rooms. She sped across the foyer, through the empty kitchens, and into the castle proper. Sneaking around the great keep after dark was one of her favorite hobbies, so remaining hidden posed little challenge. She knew every guard station and hidden passageway. More importantly, she knew which guards were most likely to be dozing. She froze in a crouch, then realized the voice was familiar. The tall, redheaded Jerine crept out of the gloom and into a shaft of moonlight let in by the narrow windows near the staircase. She wore a long, dark nightgown and slippers. “I can’t explain right now,” Kir’Ana interrupted quietly but firmly. “I don’t think I was sleepwalking but–,” Something clicked in her thoughts, taking her words away. She had passed through a massive closed door. Her rooms were along the high, windowless castle wall directly above the courtyard where she had landed. Given her history of sleepwalking, could she have passed through the wall and fallen without any assassin involvement whatsoever? Besides, why would an assassin throw her from the roof instead of just cutting her throat? Her shoulders slumped. Kir’Ana sighed quietly, realizing she had little choice but to level with Jerine. Besides, she might need help carrying out her plan. Silence. Blood dripped into the young princess’ eye, stinging badly. Her throbbing head and the pain in her knees and toes intensified, reminding her of all that had just happened. Kir’Ana again considered the multiple new symptoms she had just displayed, and felt the crushing weight of their meaning. A quick glance up and down the broad hallway confirmed that they were still alone. Kir’Ana drew closer to her old friend. “I leave for Pallas in just a few days,” she murmured. The truth of those words stung Kir’Ana as she uttered them aloud for the first time. If a Touran Queen’s only child were to die or go missing, by law she must give birth or adopt a new heir. But Kir’Ana would soon go mad; all Emergents did, and often violently so. She knew her mother well. It would kill her to replace her only child if she still lived. However, there was no cure for Emergence. With all of the other problems plaguing the Protectorates, both foreign and domestic, a leadership crisis could be disastrous. So Kir’Ana would disappear, allowing everyone in Touran to consider her dead. Freeing her mother to do what she must in the name of the kingdom. Jerine said nothing. Kir’Ana found her hand in the dark and led her through the hallway. This entry was posted in Uncategorized on September 7, 2015 by thetomewriter. Greetings, All! Here is a little bit more on the Happenings that have been Happening, as referenced a few posts ago. I’m a huge NFL football fan as many of you know. Football has been called “the ultimate team sport” because success is so tightly bound to the interplay of all teammates. I love watching that process work on the flat screen every fall weekend, but far too often I have skipped the “team” part of the plan when operating in real life. A few weeks ago I was introduced, through a friend of my GeniusWife, to an author who lives here in the Cincinnati metro area. But not just an author; a NY Times and USA Today Bestselling author, who writes YA fantasy, and who attends the same church as my wife’s friend. Her name is Carey Corp. Within moments of our introduction, she invited me to join her writer’s group/social club that meets in northern Kentucky every month. I was blown away! I had not been to an in-person writer’s group of any kind since around 2011. At the first meeting, I was further blown away. There was so much encouragement, such great advice, and a genuine desire to help new and unpublished authors such as myself. Carey is “The Query Whisperer”. She is really, really good at writing query letters to agents, and has a great track record of helping others improve their queries and thereby their positive response rates. She offered to review my query (which I always liked, but which has a TERRIBLE positive response rate. Like, 2% terrible) and provide feedback. Incredible. A bestselling author in my genre willing to help me get an agent. Umm… yes, please! She also offered to review my first chapter and give feedback, since most queries include the first few pages or chapter for review by agents. Her comments were stellar. Suddenly I had an improved first chapter and a shiny, crisp new query letter to go with it. So why did Carey give me all of this help? When I asked her, she said “it takes a village” to get published. Which is to say, it takes a team. For example, she is great at writing queries but hates writing synopses. She goes to a friend for help when a synopsis is required. Moreover, she said she loves to work with aspiring authors. But I strongly suspect that this is also a God thing; it has His fingerprints all over it. Getting Carey’s help was grace – undeserved favor – being poured all over my publishing dreams. Incredible. Is it a coincidence that once again something amazing has come through my GenuisWife’s connections? Connections that tie directly to her new role as a ministry leader? No, I don’t think so. What’s next? I have no idea. My new query is out there now, and I am expecting positive results. In the meantime I am conducting a round of edits to the rest of the book that echo the improvements Carey recommended for chapter 1. And I have started book 2 after finally deciding where the story begins (true to form, it starts with Kir’Ana in mid-air). Finally, if you love YA fantasy-romance, I have a must-read series recommendation. Carey Corp and Lorie Langdon’s DOON series is excellent! I knew nothing of fantasy romance novels until I read DOON and DESTINED FOR DOON a few weeks ago, but they are just great reads! Book 3, Shades of Doon, was released just days ago and is exciting from page 1. Super-highly recommended for anyone who loves Broadway showtunes, Scottish fiction (Outlander! ), or just good YA fantasy. And if you’re like me and have never read anything like this genre, I promise you won’t regret it. I am a total fan now. This entry was posted in Uncategorized on September 4, 2015 by thetomewriter. 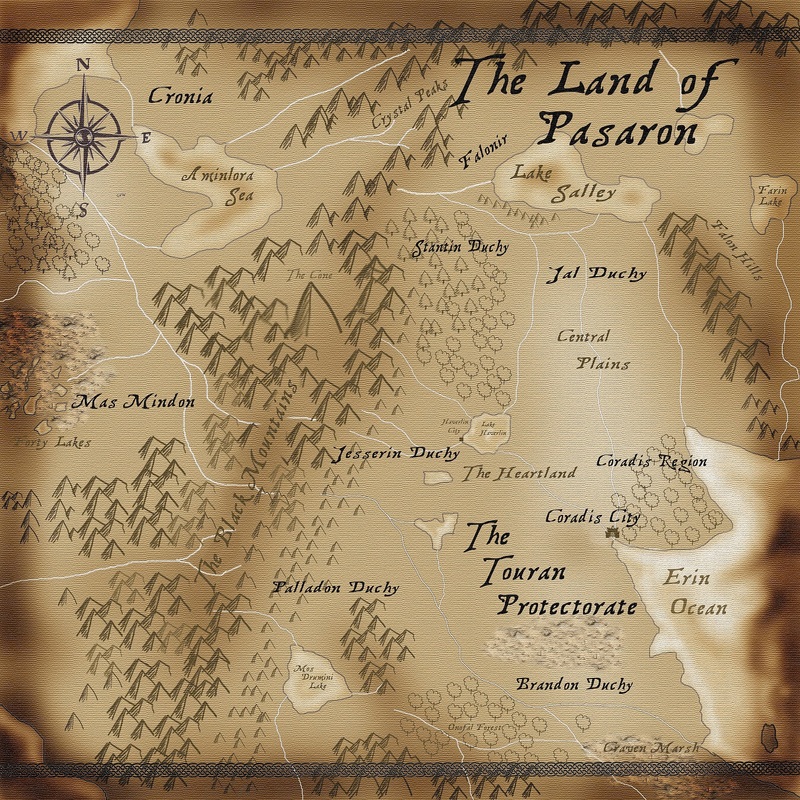 Here’s the beautiful new map of the Known Lands of Pasaron. Endless thanks to Rob LaBella for this gift!! This entry was posted in Uncategorized on August 25, 2015 by thetomewriter. Greetings, all! It has been a very long time since I have posted, and even now I will be brief. Much has changed since my last submission to this blog! A final editing wave of THE PROVING, a massive and truly wonderful job change, and most recently a wave of new activity within social media as an avenue to get THE PROVING published. I’ve been active on Twitter for almost as long as I have been writing, but lately I have taken my presence there to another level via a series of Twitter-based writer’s contests. The first of these was #PitchToPublication, where queries were submitted to a group of volunteer freelance editors for their review. The per-genre winners each receive free manuscript edits and a potential fast-path to agent attention and hopefully publisher interest. The second was #pg70pit, a nifty contest where writers submit the 70th page of their novel to a big group of volunteer editors. The best pages win similar chances at fulfilling their publishing dreams. Fun! Hundreds of people submitted to each contest, and should anyone take an interest in my work I will naturally let you know. But one of the great side-effects of this wave of social media interaction has been getting to electronically know a huge group of like-minded writers out there in the twitterverse. Fantastic peer interactions, writing and publishing tips, and plenty of humor abound! In the meantime, I am still within the Author Salon process and am hopeful that through one of these avenues good news will come. Additionaly, I am flirting with the idea of beginning (in earnest) to write book two, The Council of Lords. After all, I have always said that I planned to write The Tome of Pasaron for my own enjoyment, not only to be published and sold. Perhaps the time to return to the keyboard has come! More soon, and thanks for reading! This entry was posted in Uncategorized on July 5, 2015 by thetomewriter. For those of you who have been following along with my journey through the Author Salon peer review process, today was a very big day! THE PROVING was promoted to the final level of peer review, called Editor’s Suite! This means I will now enter another, more intensive round of peer reviews and editor critiques of both the novel’s profile and the manuscript itself. This is very exciting for me, since the next step is to have the book directly marketed to agents and publishers within the Author Salon process… Hopefully to be either signed by an agent or acquired by a publisher, or both. If any of you early readers out there are working your way through the book, please shoot me any and all feedback you have. This would be a great time for it as these new peer review sessions get going. And if anyone reading this does not have a copy but would like to read it (or if any of you have an older, unedited copy and would like to see the newer, cleaner version), just let me know! This entry was posted in Uncategorized on September 16, 2014 by thetomewriter.